Australian Cattle Dog A member of the AKC Herding Group, this dog was bred to herd cattle. They are a medium size dog with high amounts of energy. Like most members of the herding group they are happiest when working or given a job to do. A perfect companion for those who have lots of space for these dogs to run. 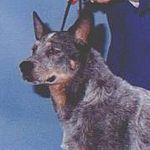 more information on Australian Cattle Dogs. Australian Shepherd An excellent dog breed for herding both cattle and sheep. Suited to performing extremely well in agility trials and as a search and rescue dog. They are a loyal and independent dog who needs plenty of daily physical and mental exercise. more information on Australian Shepherds. Bearded Collie Originally bred as a sheep herding dog, this breed has a gorgeous long haired coat and a clownish temperament. These happy and playful dogs need to be kept active and require large amounts of exercise every day. A great companion for those desiring a high energy, intelligent dog. more information on Bearded Collies. Beauceron This dog breed originated in France as a herder of cattle and sheep. They are commonly used as guard dogs as their natural tendency is to be wary of strangers. Fearless but also gentle, this a larger member of the Herding Group. Plenty of exercise and patient, slow training for their first three years, is needed with this magnificent breed. more information on the Beauceron. Belgian Malinois Originally bred as sheep herding dogs in Belgium, this breed is commonly used as police dogs and military working dogs. They are one of the four types of Belgian sheep herder breeds. Similar in appearance to German Shepherds, they are lighter and more elegant in their look. more information on the Belgian Malinois. 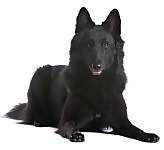 Belgian Sheepdog A beautiful long coated herding dog from Belgium. This breed was used extensively in World War I as messengers and sentries, and remains a popular police dog. They are intelligent, fearless and gentle. Like all herding group breeds, they need plenty of exercise every day. more information on the Belgian Sheepdog. Belgian Tervuren Another of the four shepherd breeds from Belgium, these dogs were named after the village of Tervuren. Their long coat is gorgeous and requires maintenance. They are a loyal and energetic breed requiring plenty of daily exercise. more information on the Belgian Tervuren. Border Collie The herding style of this breed is unique ~ an intense gaze and stalking movements, making it a prized shepherd. The AKC even allows "honorable scars and broken teeth in the line of duty" as acceptable, demonstrating their respect for the skill and standing of the Border Collie breed. more information on Border Collies. Bouvier des Flandres A large size dog in the AKC Herding Group, Bouviers were bred in Belgium to help with the work of farmers and butchers. They are independent dogs, as are all herding breeds, but love the company of a family. Daily exercise is a must for this loyal breed. more information on the Bouvier des Flandres. Canaan Dog This is a territorial breed that originated in the Land of Canaan. Outstanding herders, they have proven themselves equally adept as guardians, dogs for the blind, mine detectors and helpers for the Red Cross. This breed needs large amounts of daily exercise and mental challenge. A wonderful member of the family that is willing to please you. more information on the Canaan Dog. Cardigan Welsh Corgi Of the two Corgi's, the Cardigan Welsh Corgi is the older breed and the one with a longer tail. Originating in Wales, this breed is an outstanding cattle driver, nipping at heels and adroit at avoiding kicks. Although a small breed, they need daily vigorous exercise. Loyal, faithful companions, these dogs love to play. more information on the Cardigan Welsh Corgi. Collie This is an elegant looking breed with its origins in sheep herding. A large dog with a classic wedge shaped head and an intelligent face. These family dogs are very friendly and mild mannered. Like all breeds with a herding heritage they need daily exercise and mental stimulation. Entlebucher Mountain Dog Originating in Switzerland, this is one of the four Swiss Mountain dogs. Used for moving cattle, they now enjoy excellence in sporting competitions. Highly intelligent, they need a large amount of daily exercise to keep them happy and healthy. more information on Entlebucher Mountain Dogs. German Shepherd Dog Considered to be one of the most intelligent breeds of dogs, German Shepherds are excellent guardians and herders. This is an energetic and loyal family member requiring regular exercise. They remain one of the most popular breeds of dogs and are used extensively as guide dogs and service dogs. more information on German Shepherd Dogs. Old English Sheepdog These comical, fun loving dogs were originally bred to drive herds to market. Their profuse coats and bobbed tails make the breed stand out. Intelligence, loyalty and adaptability make this breed an excellent family dog when provided with good daily exercise. more information on Old English Sheepdogs. 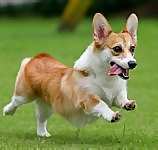 Pembroke Welsh Corgi Originating in Pembrokeshire, Wales, this small dog is incredibly adept at driving and herding. They have been a favorite breed of English royalty for quite some time. Energetic, devoted and playful, they need daily exercise to keep them at their best. more information on Pembroke Welsh Corgis. Shetland Sheepdog Also known as Shelties, they were used in Scotland as all-around farm dogs and herders. An energetic, intelligent and sensitive dog, with an intense devotion to its family. Daily exercise is required as well as almost daily brushing of their coat to keep them happy and healthy. Swedish Vallhund The Swedish Vallhund is often referred to as a big dog in a small body. Known to be fearless, it has been used for centuries as a farm dog herding cattle and sheep. Today, they often participate in obedience, agility, tracking, herding and flyball. Lots of energy, eager to please, alert and athletic characterize this breed. The Swedish Vallhund makes an excellent family companion. The dog breeds that comprise the members of the AKC Herding Group are unique, in that all of these animals have the ability to control the movements of other animals. These breeds are known for obedience, stamina, loyalty and intelligence. The herding breeds were developed to work with man to help him drive and herd animals, such as cattle and sheep. Much like the breeds in the Working Group, Herding Group dogs are happiest when working. Mental, as well as physical, exercise is required to keep these dogs strong, happy and healthy. Some of the more well known breeds in the Herding Group are Collies, German Shepherds, and Old English Sheepdogs. Herding Group dogs are considered easier to train than many other breeds, and make excellent family companions as well as outstanding working dogs. This breed directory page features dog breeds that are members of the AKC Herding Group. BreedersClub.net does not pre-screen the dog breeders who advertise their puppies and dogs for sale in the BreedersClub.net breeder directory and in the classified ads. We require all advertisers to agree to our advertising terms. You should ask the dog breeders you talk with for references from past buyers and veterinarians.